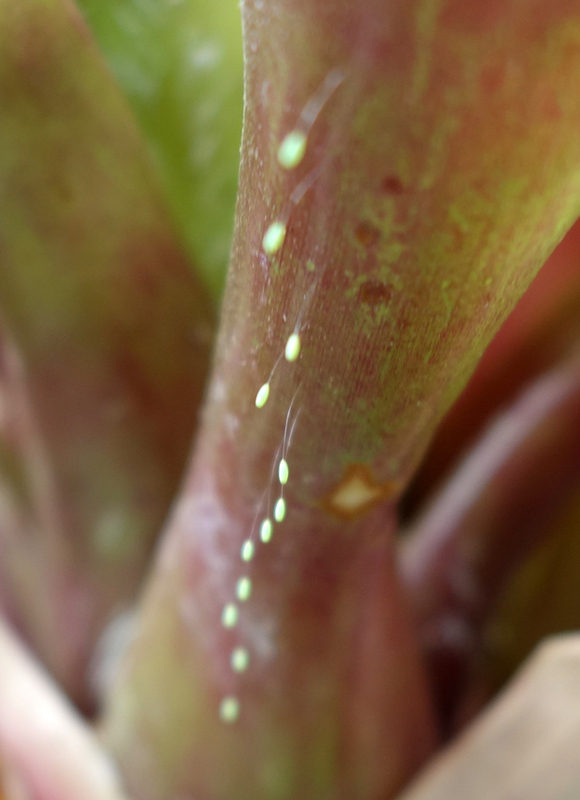 I noticed these odd little eggs laid in a row on my Neoregelia 'Fireball' bromeliad, and wondered what they might be. Fortunately, they were simple to google and it turns out they are lacewing eggs! Lacewings are beneficial insects in their larval form and are pretty much neutral in their adult stage, so I'm very happy they want to reproduce in my space and protect my plants from aphids, mealybugs, and hopefully even scale. I've been fighting with mealybugs in several of my stapeliads and a couple other plants and scale on one of my haworthias - I think due in part to stress and lowered immunity from spending so long indoors thanks to the unusually cold April we had (the coldest in 20 years! ), so this might be just the ticket to getting rid of the rest of the pests. 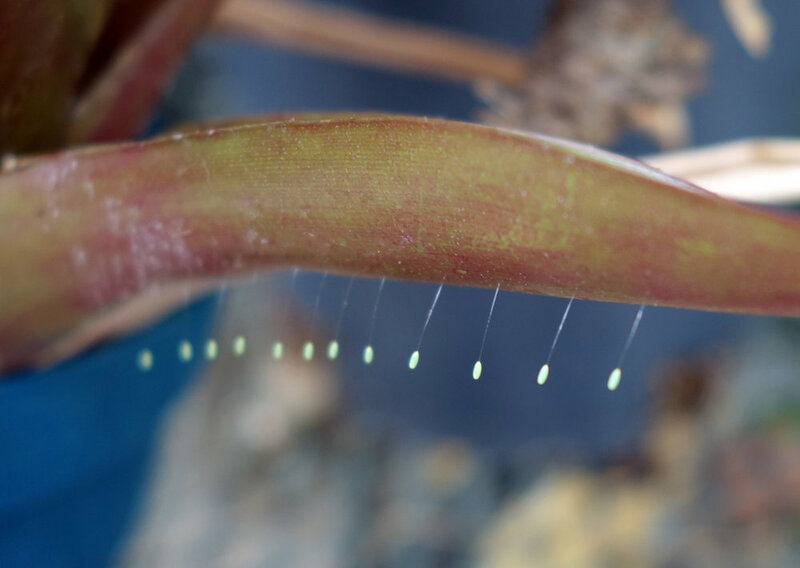 The Neoregelia 'Fireball' spends the summer on my front porch, but when I went to my back porch I also saw a lone lacewing egg on an Adromischus (A. rupicola is my guess, but there are a number of similar species within Adromischus and my plant supplier didn't have this one labeled and is wrong on labels around 15% of the time anyway!). So that bodes well for lacewings frequenting both sides of my plant collection! Some people even purchase bulk lacewing eggs (or adult lacewings with the goal of having them stick around to reproduce) as pest control, much like they do with ladybugs and other beneficial insects. This practice of purchasing insects for natural pest control is more complicated than it might seem, though, since it can negatively disrupt the local ecosystem, and often disregards seasonal timing needs for the purchased insects and the insects' preferred habitats. It's better if you can just encourage the beneficial insects already living in your area to feel welcome in your spaces.